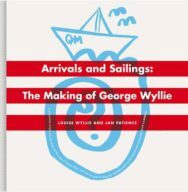 This extract highlights how George Wyllie’s bold artistry connected him to both Scotland and to the wider international arena. 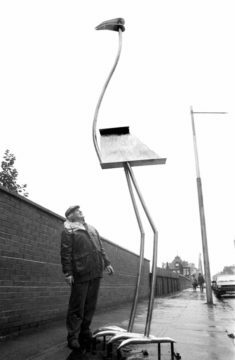 Through authors Wyllie and Patience we are given fascinating insight into the political and cultural context of his 1980s sculptures ‘A Robin in a Cage’ and ‘Berlin Burd’. The liberation George felt at being able to pursue his art on a full-time basis led him to make connections and form firm friendships with many like-minded souls. He may have been in his sixties, but he had the energy of a man half his age. 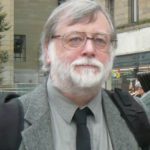 His gregarious nature helped, of course, not to mention his ability to get on with people of all ages from all sorts of backgrounds and cultures. In 1981, as well as his work with Beuys in Edinburgh, he exhibited with Dawson Murray at the Stirling Smith Museum and Art Gallery in a show called Counterbalance. For this thoughtful exhibition, George made sculpture in response to Dawson’s paintings and vice versa. Years later, in 1999, George and Dawson revisited this idea of responding to one another’s work with a monumental installation in Glasgow’s brand new Buchanan Galleries shopping centre. In this work, Divine Rythm, George suspended a 400kg stone on a stainless-steel beam in front of Dawson’s painting of the earth’s strata. 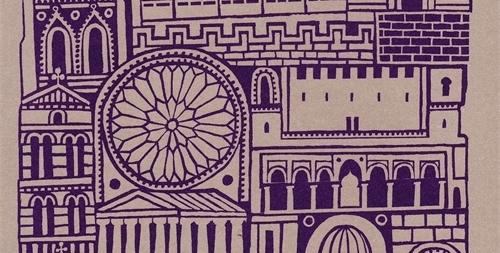 It was underpinned by a quotation from Hugh MacDiarmid’s poem ‘On a Raised Beach’. In 1981, George also had another solo exhibition at Strathclyde University’s Collins Gallery called A Way with the Birds, which travelled on to London’s Serpentine Gallery, where it was a major attraction during the summer months. This was George’s first big exhibition in London and it attracted press attention on an unparalleled scale, especially outside Scotland. This included an appearance on the BBC’s popular early evening current affairs programme Nationwide. He started to receive fan letters and he made sure he answered each and every one of them. The exhibition’s title was a nod to George’s continuing fascination with making birds from steel – or ‘burds’, as he referred to them, in the Scots vernacular. 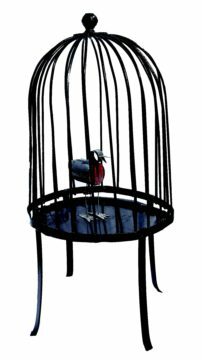 A Way with the Birds featured several portrayals of birds, including A Robin in a Cage, a simple yet poignant little steel robin – with painted red breast – trapped in a cage. One of the biggest hits at George’s A Way with the Birds exhibition was the Heath Robinson-esque All British Slap and Tickle Machine, a kooky contraption with a recycled bicycle seat for people to sit on, operating pedals, a welter of floppy leather hands and a somewhat risqué tickling finger. George told the media this machine was designed to prevent the loss of ‘a sense of joy in things’ during the Thatcher years. George’s gift for making people laugh brought all sorts of visitors into galleries who had never visited one before. The Serpentine Gallery staff were amazed at the laughter ringing through the space during the exhibition’s run in London. George knew, from his lifelong fascination with performance, that humour was a way to permeate people’s hearts and minds.